Thanks to Anita Preston Schaezler, daughter of Capt Clark Preston, aircraft commander. 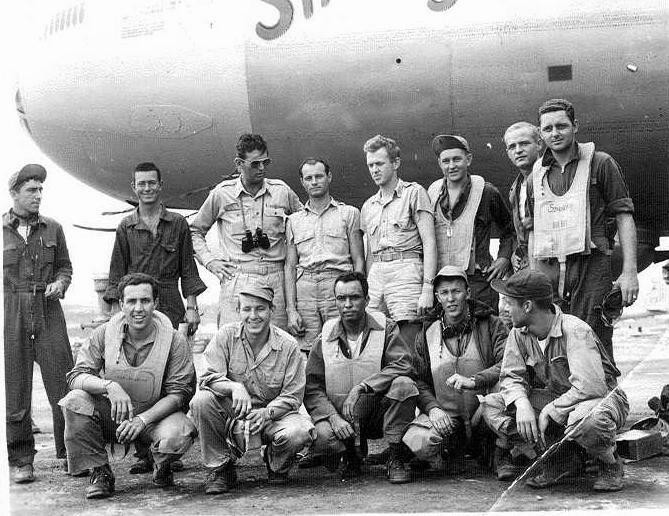 Capt Clark A. Preston and his crew were the first to land on Tinian in a B-29, named Snooky. The airplane was named after his daughter Anita Preston. Tragically, Capt Preston and many of the crew members were lost on April 7, when they were flying a replacement aircraft that had just arrived from the states. Crew #2418, the original crew of "Snooky"
This appears to be the first of the two pictures since the name "Snooky" has not yet been painted on the side. Kneeling - Left to Right: Sgt Edward E. Birsner (Radarman), Sgt William P. Ford (CFC), Sgt Marcos S. Duran (T Gunner), Sgt Donald J. Parker (Radio), T/Sgt Eugene M. Arms (Engineer). Recollections of T/Sgt Eugene M. Arms (Engineer). My dismal existence on this earth started in the fair town of Reading, Pa. on the second day of April, 1921. My narrow escape from being born on a day set aside for fools often terrorized me in my youth. I can now claim I am not a fool as I wasn’t born on the first. My grade school life was very ordinary, but high school proved a little different. I started off with the academic course and soon realized my mistake when I flunked French, German and Latin the first year. A father and son talk with the principal followed this and a program was worked out where I had mechanical drawing four hours a day minus languages. As long as I had no languages to contend with I was happy. I finished school in 1937 with the equivalent of 5 years of mechanical drawing behind me. In the years that followed, until the army, kept me pretty busy. I worked for a plasterer for 6 months, but I got tired of that and quit. After that I decided on an apprenticeship in tiling. After 3 1/2 years I completed this and kept at it until the Army grabbed me in July 1942. My basic was at Atlantic City, which lasted eight days. It was there that I got my first bitter experience of what army life would be like. On a sweltering Sunday they made me move from one hotel to another, 2 1/2 miles down the boardwalk. I had to carry two barracks bags and a traveling bag and with the boardwalk jammed with people it was something I will never forget. After that came A.M. school at Seymour Johnson Field, N.C. When I graduated they made me an instructor. That continued for a while and then they sent me to Sperry gyro factory in N.Y. for a course in gyro instruments. When this was finished I went on a long tour of detached service at Langley Field, Wa., Richmond A.A.B. and Columbia S.C. I then returned to Seymour, N.C. and got a M.O.S. of 750 after working on the line for a while. Later it became 751 of flight chief. I had flown in B-17, B-24, A-24, A-31, B-18, B-25 and A-20. Then came a chance for engineering school and I took it. Off to Lowry Field I went little dreaming it was to be B-29. I graduated from Lowry in July 1944 and after a short stay in Lincoln I came to Grand Island, Nebraska. The town is pretty good they tell me. I wouldn't know as I prefer the field and the sack. 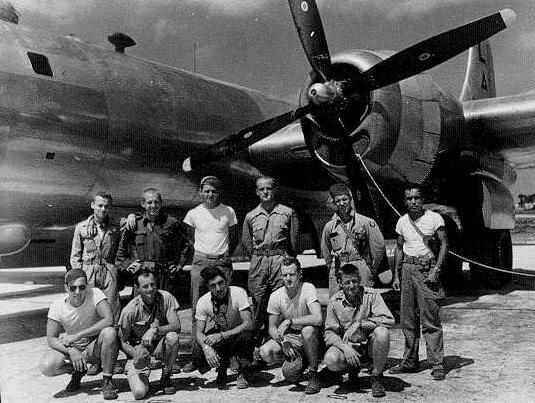 The B-29 is a good ship but I often think of those swell little A-20's.